Nothing says Happy Birthday like summoning the spirits of your dead relatives. Alex is a bruja, the most powerful witch in a generation and she hates magic. At her Deathday celebration, Alex performs a spell to rid herself of her power. But it backfires. Her whole family vanishes into thin air, leaving her alone with Nova, a brujo boy she can't trust. A boy whose intentions are as dark as the strange marks on his skin. The only way to get her family back is to travel with Nova to Los Lagos, a land in-between, as dark as Limbo and as strange as Wonderland. When I read the description of the novel I was very interested to see how the Hispanic traditions and belief system would take shape in a fantasy novel that wants to stand beside the likes of H.P. I think this series can hold its own and it can appeal to both, Hispanics and non-Hispanics alike. However, as a bilingual speaker of both Spanish and English, I was annoyed at the narrator and the way she decided to read some words such as "Dios" "enchantress" "mamá" "papá". Since I don't have the ebook of the novel, I can't tell if this is a problem of the original spelling in the novel or it's a problem with the way the narrator mispronounces some crucial words in the story. 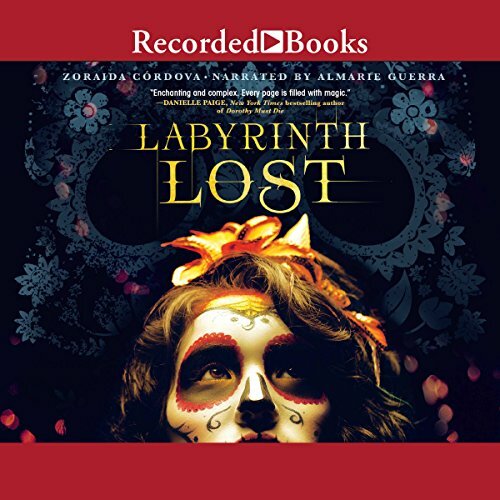 This aspect of the narration rubbed me the wrong way because the Hispanic accent the narrator was trying to use sounded very artificial when mispronouncing these common words and did not flow with the story. Pretty good universe for the story line. Nothing extraordinary just pretty good. Note: lots of Hispanic words... would have been a good idea to use a Hispanic reader. Labyrinth Lost follows Alex, a Bruja who's afraid of her own power and decides to cast a spell on her Death Day to rid herself of it for good. What she didnt realize was that with her magic being tied to her blood getting rid of it means getting rid of her entire family, ancestors and all. Now to save her family and the souls of her ancestors she must travel to the underworld and find the Tree of Souls before the Devourer whos made her home there consumes them all. After having avoided magic her whole life Alex will need to recruit the help of a mysterious Brujo named Nova if she's to navigate Los Lagos in time to save her family. I found Alex a bit childish at times, but she does grow a lot throughout the novel. I really appreciated how she held herself accountable and tried to right her mistakes, but I didnt connect with her as much as I wanted to. Even though I understand why she doesnt want magic I cant relate to it. I did relate to doing everything in ones power to help their family though. The family dynamics felt realistic and I loved how we got to see a long line of strong female family members. I liked Alex little sister, who often acted more mature than Alex herself, but thats probably due to her power. With their mother trying to raise them by herself the older sister came off as a second parental figure nagging out of love. I really loved her best friend Rishi. Shes such an interesting character and an amazing friend. She's probably my favorite character in the book. Nova on the other hand was the typical bad boy, but still managed to surprise me in the end. I also really loved the romance and how it didnt overpower the story or change the character. It definitely bumped up my overall rating. Im not one to remember book kisses, but this book had a memorable one. I thought the bi rep was very well done. Not every author seems to understand that once we commit to a partner we dont always cheat/have feelings for someone else. Dont get me wrong it happens like every other type of relationship, but its definitely not the norm. I really enjoyed the world with its rich Latin American culture. Los Lagos was a fascinating place, especially with all the different creatures. I honestly wish we got more info and page time with them. I also thought the magic backlash added a nice layer of believability. The plot wasnt anything super original with the whole chosen one trope with the usual power hungry villain, but the diverse world really set it a part. We did get some information about the villain, but not nearly enough. I thought the pace was fantastic. Never a dull moment. Its harder to judge the writing while listening to an audiobook at 2x the speed, but I found it flowed well. I had to backtrack a couple times, but for the most part I found it clear and engaging. When I first heard of this book I had no intentions of ever reading it. Urban fantasy just doesnt appeal to me anymore. What ended up selling me on this was the diveristy. I knew I probably wouldnt get around to it on my own so I requested review copy of the sequel and asked a friend on Goodreads to buddy read it with me that way Id have to pick it up. The ending was satisfying while still having a bit of a cliff hanger at the end that has me intrigued enough to want to pick up the sequel. It doesnt follow the same character, but we do stay in the same family following Alexs older sister so hopefully I get to see more of their little sister and the wonderful Rishi. There are quite a bit of Spanish words this narrator couldn't pronounce, which sometimes ruined the flow of the book. As a Spanish speaker, I think this is really important. Please cast someone who can pronounce Spanish words. I loved it, but I admit I struggled with some parts. I loved that it was a story by, for and centered on latinx culture. I adored that Alex, the mc, was bisexual and liked both her love interests were of color, despite one of them being passing. It was also cool that she was reluctant to be a receiver of her great power, and wasn't just "ready" like a bunch of ya books. The parts I struggled with only centered on the way eurocentric features were exhaulted over the latter. Nova had blue-green eyes, and his features were often described with much more flattering tags than brown eyes and skin. As an afro-latinx person, I totally understand our culture does blend a number of cultures, but a lot of the black people were in passing, had skin described as food or night, or were kind of magical negros(I'm sure it wasn't intentional). It may not be as obvious to non-black latinx folx, but you can always tell by the description tags when an author isn't black. I would've given it a five had it not been for that. I loved it so much, its just when it rubs you wrong, it affects your feeling about the story. Before I go though, I loved that Rishi, Alex's bestie and crush was Indo-Guyanese, you hardly ever see desis of Guyanese origin in mainstream novels. For those curious, Alex is Mexican and Puerto Rican (with Ecuadorian and Panamanian origin) because I'm Caribbean afro-latinx, so I like to know that kind of thing. This reminded me of Disney's Brave, and Brave was so amazing, do that's a testament to how much I enjoyed! Didn't make that much sense. I wanted to like it because of the diversity and culture behind it but all that rich mythology was squashed into obstacles for the (very whiny and not very smart) protagonist. Great idea, badly written. It's quite incredible that I actually enjoyed this book. You see, it started with three strikes against it. 1, it's urban fantasy, which I very rarely enjoy. 2, it's written in first person, which drives me nuts. 3, it's written in present tense, which is almost never done well and almost always feels like a gimmick to create artificial immediacy (and usually fails to do so). So, you might ask, why did I read this book? 1, I'm trying to branch out into books I wouldn't normally read. And 2, I'm a long time listener of the Writing Excuses podcast and they recommended this book a while back. To start things off, the narrator was quite good. She has a good assortment of voices, well chosen pacing and tempo, and skillful vocal inflections. My one complaint is the inconsistency (or, to be more accurate, global consistency) of her accents. Every character speaks the Spanish words with the correct accent, but no character speaks in accented English. In fairness, no one is described as doing so, by some characters felt to me as though they should/would. Okay, the story did start a bit slowly with a slice of Alex's daily life. However, once the story starts moving there is a lot of action, intrigue, and fascinating mythology. There is a relatively obvious twist near the end and a sweet, if predictable, romance. I spent a fair portion of the book not being overly fond of Alex, as willful ignorance is something that really irritates me. In the end, though, she redeems herself and becomes a wonderful character. I'm not certain if I'll continue the series, as I'm still hesitant to willfully enter into a book with three strikes against it from the get go. But we shall see. It really draws you in with the storyline, can't wait to read the next book.. I love this book I hope there's a sequel !!!!!!!!! Really love the diversity in this book as well as the worldbuilding. The characters were interesting and the narrator did a great job of bringing them to life! Overall this was a pretty enthralling book. I really liked it but I wish it had more characterization with Rishi or perhaps more time with her. Thank you to the author who kept the real work of magic real. Also real love for self family and the earth. I don't really have words for how wonderful this book was. Intersectionally feminist with a wholly unique plot, and beautiful prose to boot. I don't know if there will be more in this series. While I'd be thrilled if there were, this is also a beautiful stand-alone.